My year end run finally arrived and I had no clue if I would ever finish 88km. Weeks before this event, I participated in many LSD’s and attended training sessions just to make sure that I would be free from injury and that I would have the endurance I needed. 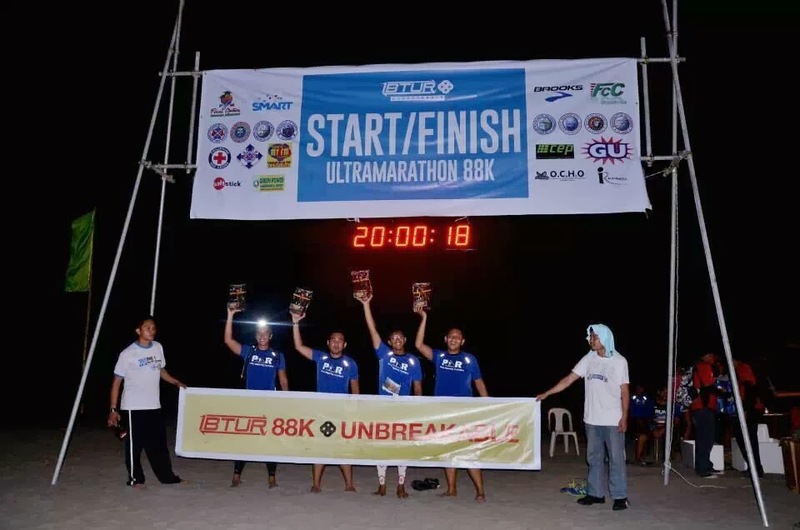 This event was organized by iRunner, Mr. Randy Abasolo and was held at San Juan, La Union. I think this was a good event as it was able to showcase the beauty of La Union and also to exeprience the true hospitality of the people. A group of elite and first time ultra marathoners gathered at the bus station on our way to La Union where IBTUR was held. It was an 8 hour bus drive with two stops. We arrived at 7am on Friday and went straight to Andrew’s house for breakfast. He was also from La Union and was kind enough to serve breakfast for us. A few meters away from their place was this nice long stretch of beach. The fine sand and strong winds made us want to just relax and surf. We took so many pictures while we were here. It was so relaxing! One place we visited was Halo Halo De Iloko. There were so many people when we arrived, just a proof that this place serves good food and Halo Halo! Friday evening and all the IBTUR participants were invited to RUN FOR TACLOBAN. A 3km fund raising event at the beach. The beach was so inviting, even at night. We dipped and swam and had a great time! The run started at 3am Saturday, 30th of November 2013; an 88km run that would test our endurance and bravery. 88km is such a big number in ultramarathons as only a few of this distance have been organized. We had a chance to meet fellow participants. Only a 100 were invited to join this event. Few more minutes and this clock will start ticking! The gun start was at 3am and we ran towards our first water stations. We just loved the energy. We were offered coffee, bread and porridge by the locals. It felt like there was a big celebration! We were not the only ones who enjoyed taking pictures along way. Enjoying the opportunity of this long road. It was a hot morning and still managed to take some pictures. The roads there were not that busy throughout the event. We arrived at another aid station where we had bananas and lots of fluids. I really enjoyed how the people were cheering us along the way; asking us where we from and always trying to make conversation. We also met Sir Jay during the run; a nice fellow with a strong will of determination. Thank you so much Red Cross for being there at the event as well. Finally reached Santol. Loved the smiley! Came across this church and had another photo opportunity. We also supported the locals. We had pinipig ice cream as we approached our 40km mark. 40km done, 48 more km to go! Few meters after the 40km mark, we were faced with never ending uphills. Steep uphills! It was past lunch time and saw the people at the water station eating lunch so we asked if we could have some and they were nice enough to share. We almost finished all of their food! Oooops! Another steep uphill to climb. And finally I reached 50km mark! An ultra marathon first for me! I think we reached the top of the mountain. The view was spectacular and the cold breeze was invigorating! We had an opportunity to mingle with the kids. They were so cute and gave us high fives all the time. Just what we needed as exhaustion was building up. I want to thank all the people who supported us, such as the locals at all the aid stations, different organizations who were there who helped the participants and also to make this race safer for the runners. This sprinkle helped a lot. This was on our way down from the first mountain. We didn’t expect that there would be another mountain that we would need to climb and that was the worst! As we approached the second mountain it was already dark and no lights around. We basically relied on our head lamps. It was so difficult and steep and we didn’t know what’s around us which made it scary. This was the place where we felt the it was the steepest! This pic was taken after conquering the second mountain and we were really exhausted. Yet, we had no plans of giving up. We were determined to finish this race! After 20 hours, we finally reached the finish line. My feet were so sore and the last 700 meters was on the beach which added to the challenge. Thank God I received no major injuries during the entire race. The morning after, all we talked about was IBTURRRRRRRRR!!! All the stories about struggles and challenges we encountered were truly inspiring, specially how each one conquered them. All the training finally paid off and we felt so much stronger and confident after IBTUR. We ate like there’s no tomorrow. We were so happy that we all finished and conquered the IBTUR 88km. Something that we could be proud of for the rest of our lives. Thank you to all the organizers and people of La Union. To the Gacayan’s Family for the support they provided us during the entire race. Expect that we will be joining the 2nd leg of IBTUR again! This shirt says it all! I also considered this as one of the hardest, toughest and yet, the most memorable run of my life! Congratulations to all the finishers! How did they decide on that incredible number of 88 km? I think this is the first time I have ever heard of such a distance for a marathon. Congratulations! Thanks Louise! It took us months to prepare for this.. We prepared mentally, physically, financially and more. The people of La Union were very supportive and didn't left us behind until the finish line! Looks like you guys had fun! 100 joined but did any one give up? 88km is longer than me travelling from one end of Singapore to the other! Grabeee. 88-km is no joke, sobrang saludo ako sa'yo. Give yourself a pat on the back for this. You should try the BDM run, it's more than 100-km. Congrats on finishing Ibtur. I really haven't thought past a marathon. You look like you had a lot of fun on the race. I am filled and enjoyed appreciating your pictures rather than your account on the running event. You've a better running experience, I believe. I am curious to know on who you got started in running a long-distance trail for this matter. 88km is crazy omg! You guys had so much fun 😀 Keep motivated! What a great event and a fun gathering. I had a great time laughing at the different poses you and your friends/runners were trying out for the camera. I could feel the high energy too. Kudos! Seems you had fun throughout the 88km journey and even forgot how far it was. Wish i was in your shoes right now. 88km is so much! That's like halfway from Penang to Ipoh ! You're awesome, really .